You can set the countdown timer to count down from a preset time to zero. You can show/hide it from the start menu under DISPLAYS » Countdown. 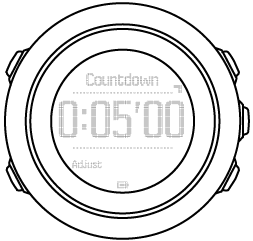 When activated, the countdown timer can be accessed by pressing NEXT until see the display. The default countdown time is five minutes. You can adjust this time by pressing VIEW. You can pause/continue the countdown by pressing START. Countdown timer is not available while activity recording is ongoing.